More needs to be done to address what diversity is and why it is important for the development of new and exciting work. Between my brothers and I, we've spent 38 years in the industry and seen plenty of change – new disciplines, exciting innovations, and hard to decipher management titles. It’s only really now, however, that a conversation around ethnic diversity has really opened up. We have a fairly unique perspective on this. As associate design director at OgilvyOne, associate creative director at AnalogFolk and associate recruitment director at Zebra People and all being of Asian heritage, we’ve always noticed that colleagues with the same background as us are few and far between. Our experience as second-generation immigrants is perhaps a little different from many others in our culture. Our parents came to the UK with little money, like many others, but they didn’t pressure us to take up academic subjects and aim for what are traditionally perceived to be respected careers in medicine, law or business. This can be a big hurdle for many students from low income families. Communications qualifications are a bit of a gamble when making a decision on studies, where, after graduating, poorly paid or unpaid internships make getting a foot in the door a dream. This is a problem across many industries, but there’s not really any excuse for its existence in ours. The Placement Poverty Pledge and Ogilvy’s initiative The Pipe are positive steps forwards and it’s brilliant to see large agencies in the mix. It’s not just a problem of low income however. More needs to be done to address what diversity is and why it is important for the development of new and exciting work. From secondary school through to university – teachers, tutors and careers advisors need to be kept well-informed on the broad spectrum of careers available to students in the creative industry. The default advice we received as teenagers was to do an Art & Design or Graphic Design course, but there are many other paths into the industry that need to be communicated to students early on, such as user experience and digital design. Parents should also be included in the dialogue – from teacher-parent meetings to careers workshops – parents should be re-educated about the prospects of the creative world, which can be as rewarding as pursuing careers in law and medicine. To a certain extent, the very meaning of success (as conceived traditionally) needs to be re-defined. The Great British Diversity Experiment is a brilliant example of an initiative focused on promoting diversity in the communications industry. Recruitment agencies can also play a part. A recruiter is in a unique position because on the one hand, they cannot give any preference to a specific candidate in terms of racial or cultural background (obviously not) but at the same time, they can offer advice to an employer on what diversity is, how to embrace it and why. Recruiters can also play an active role in the industry by re-educating employers and prospective candidates on the benefits of embracing diversity (through workshops, talks and mentorships). Diversity in the workplace is critical, not for ticking boxes and reaching quotas, but because it’s proven to produce the best work. Having a mix of backgrounds means that the collective skill set will be a lot broader, cultural influences will be more varied and contributors will be able to be their most creative selves without having to play up to certain stereotypes expected of them. We should be striving harder to understand the incredibly broad society our work should be speaking to. Diversity in the workplace is critical, not for ticking boxes and reaching quotas, but because it’s proven to produce the best work. There are few ethnically diverse role models in the industry. Admiring someone or aspiring to emulate them just because they come from where you come from or because they look or speak like you isn’t enough. Yes, we want to relate to a role model culturally, but also because they are sh*t hot at what they do. It’s not about diversity for the sake of diversity, but diversity for the sake of creativity. 3% of senior creatives in the UK are women and an even smaller percentage are from an ethnic background. In our experience, judging panels at awards shows are predominantly white too – even when the panel is discussing diversity. 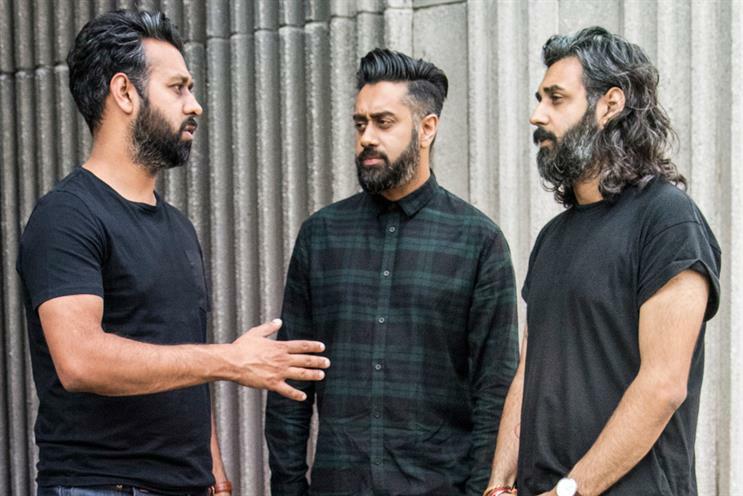 British Asians that want to embark on a career in adland need to see like-minded people from similar walks of life to feel confident in pursuing a creative vocation, knowing that hard work can pay off. Recruiters can also help to build connections and bridges between mentors and new talent. Having worked in the industry for many years, Pritesh has seen that the design community is crying out for more diversity in the pool of people that come forward to mentor. Mentorship not only helps to guide young creatives from a junior level all the way up to management but it also gives people a goal and a more defined roadmap to success. Hiten was fortunate to have been mentored by the likes of Cordell Burke (Big Dog) and Habib Patel (Ex Coley Porter Bell). They gave him his big break at Ogilvy in 2005 and was the north star that he aimed for. Vikesh found inspiration from a D&AD talk with Daljit Singh, seeing another Asian face on stage gave him the drive to get to where he is today. Diversity means our ideas aren’t dominated by the culture most present, but they can be informed by the people we are creating our work for. In advertising, we’re not always selling to the white middle class. Instead of guessing what our target market might like, we should be including the people who can truly understand the audience in the process. A group of people from the same background who now work in the same industry are, realistically, rarely going to produce something that could really surprise you – not that it wouldn’t be good, interesting, or bought by the client. It just wouldn’t be surprising. There are brands already doing this well. Nike recently released a statement that revealed more than half of their workforce comes from ethnically diverse backgrounds. But it shouldn’t be a unique case and we shouldn’t need statements to shout about it. Diversity should be the norm. So what can be done? We strongly believe there is a far more diverse pool of talent available than can currently be seen. We urge you, when recruiting, to embrace applicants from varied backgrounds, even if you don’t end up offering them a job. Be considerate of different lifestyles, traditions and priorities. Accept that the industry might need to make some changes. Be open, be flexible, and be all-inclusive. Don’t just speak about diversity – live diversity and make diversity the norm. Vikesh Bhatt is associate creative director at AnalogFolk. Hiten Bhatt is associate design director at OgilvyOne. Pritesh Bhatt is associate recruitment director at Zebra People.